Starting Sunday, a number of items in the state will be tax-free. It’s a great time to get back-to-school shopping out of the way and save on everyday essentials. Sara Skirboll, a shopping a trends expert with RetailMeNot, said 87 percent of parents are stressed about shopping for school supplies. To cut down on stress, parents should come up with a strategy: stick to their list, shop early, and compare prices. “Think about going in and buying in bulk with some other parents in the classroom. I see a lot of these lists that contain one sharpie, one highlighter, it's really nice to go buy in bulk, buy a five-pack, buy a 10-pack, buy a 12-pack and then just split the bill,” said Skirboll. The RetailMeNot survey also found that parents will spend $65 more on school supplies this year than last year. “Clothing, we're seeing a big increase. And then technology, electronics, we're starting to see more and more electronics on these teacher supplies lists everything from e-readers to tablets, calculators, of course, and that's expensive,” Skirboll said. Another easy way to save is to take advantage of Maryland Tax-Free Week. 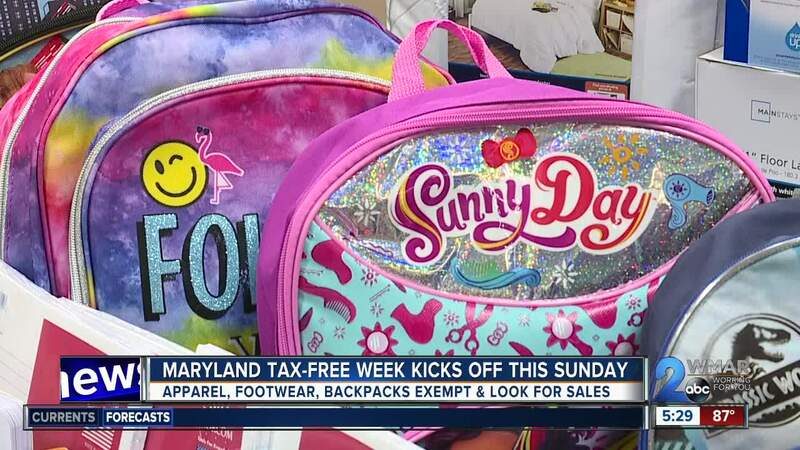 Sunday, August 12 through Saturday, August 18, apparel and footwear that are $100 or less are exempt of the state's six percent sales tax, including the first $40 of a new backpack. For a full-list of tax-exempt items, click here. School, sport, and work uniforms are also tax-free, along with your dry-cleaning! And if you're more worried about saving time, there are new options for hassle-free shopping. “We have the school supplies app, which essentially allows the customers to be able to go online and see what the exact school list is for their children, not only that, but to be able to know what location they're able to find these items in,” said Bryan Bance, co-manager of the Walmart in Cockeysville. Walmart’s grocery delivery service comes to Baltimore on Tuesday. Parents can add school supplies to their shipment or grocery in-store pick-up. 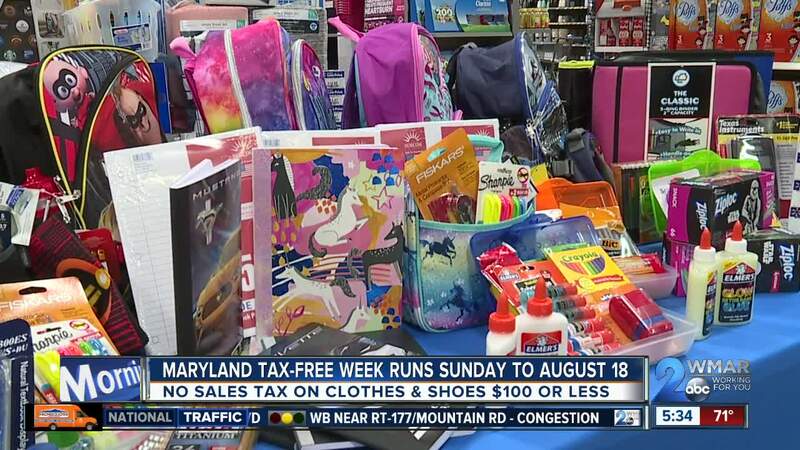 The Maryland Retailers Association along with the Comptroller's Office are giving away two scholarships during Tax-Free Week. Students need to take a picture or video that goes along with the theme of "Maryland,” write a creative caption, use #shopmdtaxfree, then upload the entry on social media between August 12-18. First place is awarded $2,500 to any Maryland university, college, or trade school. Second place wins a $1,000 scholarship. No application, essay, or interview is required. For more information on the scholarship, click here .